We want you to know how simple it is going to be to get your child's car seat installed in your new car. It is important for you to learn about the LATCH system and how it will help you out, and to learn about the testing that has been done to ensure this system is good. 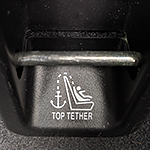 When IIHS evaluates the LATCH systems in vehicles, one of the things that they look into is the accessibility of the lower anchors that are part of the system. The system is studied to see if it is something that is easy to use and that will allow a person to properly secure a child's seat. Another thing that the IIHS evaluates is the attachment force requirement. It should not take a ton of force to get a car seat properly installed with this system, and IIHS makes sure that the installation work is something that almost any adult can do.